Whew...what a game! 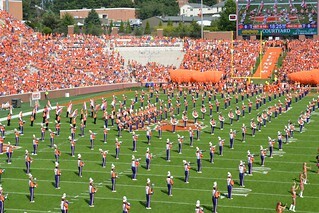 It was a nail biter until the very end, but Clemson pulled out the win beating GT 47 to 31. And to add icing to the cake, Florida State had a huge upset on Saturday, getting beat by NC State...opening a door for Clemson to repeat the ACC title. Our gameday photographer volunteers caught some great tailgating moments, gameday outfits and game action in their photos from Saturday. We also got a few photos shared with us by you, our readers. Do you have photos from Saturday's game you want to share in this album? Email them to us at clemsongirlblog@gmail.com. Check out our gameday photos below or view all of the photos on our Flickr site.